Four football players at Tech have been nominated for awards based upon their performance from the past year – Matthew Jordan and KeShun Freeman for what they do away from the field and within their communities, and Dedrick Mills and Parker Braun for their talent on the turf as a part of the Tech football team. After a season that produced a win over the University of Georgia, a triumphant bowl game, and numerous other thrilling moments, it does not come as a surprise that multiple Yellow Jackets have been recognized for their hard work. Matthew Jordan has been named as a nominee for the 2017 Allstate AFCA Good Works Team by the athletic community at Tech. The award allows for the recognition of college football players who balance academic and athletic commitments while serving their communities in exceptional ways. Jordan’s contribution to his community has come alongside his struggle with Type 1 diabetes. He has devoted time to speaking to and mentoring young people in an effort to show that diabetes does not stop him from reaching his goals. Although Jordan graduated this past spring with a degree in business administration, he still has two seasons of eligibility remaining which will allow him to continue his work within the community as a public figure. Furthermore, Jordan is expected to play as the starting quarterback, but will have to fight for the position just as he has fought to bring attention to diabetes. Whether or not he wins the award, it is a tremendous honor to receive the nomination and recognition for what he does for his community. Linebacker KeShun Freeman was named to the 2017 Wuerffel Trophy Watch List as announced by the Fort Walton Beach All Sports Association. His award, like Jordan’s relates to his service to the community. Freeman has gained recognition in the past for his work with the Atlanta youth, specifically winning the same award that Jordan is nominated for this year in 2016. Freeman volunteers with youth programs both involved with football and completely separate from the sport. He has worked with other athletes at Tech to cheer on runners during Girls on the Run and has volunteered with fellow students during the annual Kids Dance Marathon. The semifinalists for the award will be announced on November 2, while the finalists will be named on November 22. The winner will be announced on December 5 at a press conference in NYC. Dedrick Mills’ name appeared on the 2017 Maxwell Award Watch List and Preseason All-ACC team as a result of his achievements during last season and throughout the Taxslayer Bowl where he won the award for Most Valuable Player and recorded a career high with 169 rushing yards over the course of 31 carries as a B-back. The Maxwell Award goes to America’s College Player of the Year and has been awarded since 1937. Mills joins Heisman winner Lamar Jackson, as well as many other big names, on the list of nominees for the award. The semifinalists will be revealed on October 30, while the finalists will be announced on November 20. The winner will be announced on December 7. The award is based on the players’ performances from the past season, as well as the stats they are able to produce in the fall. Despite missing four games last season, Mills led the Jackets with 771 rushing yards and 13 total touchdowns. Whether or not he wins the Maxwell Award in December, he will be a key player for the Jackets in the upcoming season barring any suspensions or missteps. Parker Braun was listed on the watch list for the 2017 Outland Trophy, which is an award for the nation’s top interior lineman that has been around since 1946. During the 2016-2017 season, Braun established a name for himself by becoming the first Tech freshman to be named as the ACC Offensive Lineman of the Week following the Jackets’ away game at Virginia Tech. After the season came to a close, he was selected to be a part of ESPN’s true freshman all-America team as a result of his performances. 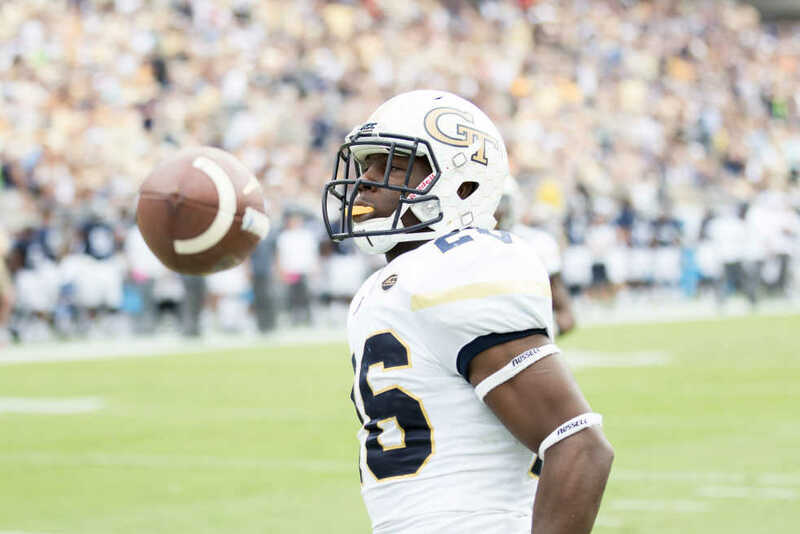 Similar to Mills, Braun was one of six true freshmen that saw playing time in their first year with the Jackets. Braun started eight games, quite a lot for a freshman under Paul Johnson. Although he is one of 81 players on the watch list for the award, he is one of only five sophomores nominated courtesy of ESPN.com. Braun is amongst many ACC players as the conference has the most nominees for the award. The semifinalist list will be announced on November 15, while the three finalists will be named on November 21 and the winner will be revealed on December 7 as part of the Home Depot College Football Awards Show. Both Dedrick Mills and Parker Braun will have to put up improved stats this season to solidify a spot in their respective awards’ semifinals and onwards. The fact that four players were nominated for such prestigious and varied awards provides a positive attitude going into the 2017-2018 season for the Jackets.